Converging together for the world’s premier web hosting trade show and educational event is an annual practice for the top influencers in the hosting industry. HostingCon is now celebrating it’s 7th annual event and this year’s show promises to be among the best ever. Early indications – such as the fact that the exhibit floor is already 100 percent sold out – point to a vibrant and energized gathering helped by a thriving technology market and the emergence of multiple high profile Cloud hosting products in recent months. Adding to the considerable experience already gathered together by show organizer’s iNET Interactive is the deep experience in hosting held by the journalists at The WHIR (having been recently acquired by iNET). The coverage of the show should be epic and for those who are considering attending HostingCon 2011, here is a bit more information to help you make up your mind. First, the particulars. 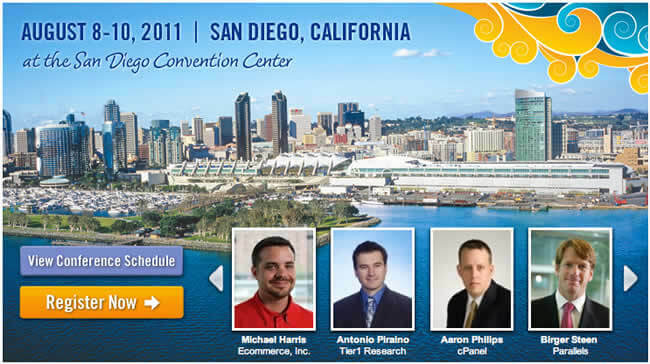 HostingCon 2011 will be held from August 8 through August 10, 2011 at the San Diego Convention Center in San Diego, California. Through June 30th, early bird rates are still in effect. You can save when you register at HostingCon.com (http://www.hostingcon.com/account/register.) Depending on the registration type, you can save up to $200. Below are the thoughts of a knowledgeable web hosting professional who has extensive experience with HostingCon from year’s past, a sneak peek from the show organizers as well. Kevin Gold is Director of Marketing with show producers and organizers – iNET Interactive. In his own words here is what Mr. Gold told us to expect at HostingCon 2011. ”Every year since 2009, the first year HostingCon was produced by iNET Interactive following the acquisition, we have strived to build an even greater experience based upon attendee feedback. HostingCon 2011 is no exception. First, let’s discuss the HostingCon educational program. This year’s keynotes were selected based on feedback from the 2010 HostingCon attendee surveys. It was clear that the opening keynote needed to be more motivational to help set the stage for the week’s events. Simon Wardley was highly recommended for his passionate, thought-provoking style, and he’s sure to get hosts thinking about their business and excited about the content to come. The second day keynote with Antonio Piraino from Tier 1 Research will help attendees peer into the future of web hosting, from a point of view driven by data and analysis. This is what HostingCon is all about – helping hosted services professionals create a vision for the future and navigate through the changing environment. The third day keynote is with Birger Steen, the new CEO of Parallels. Parallels has a vested interest in the success of its hosting partners, so has invested a lot of resources into its role as an advisor. His presentation will offer hosting providers practical, tactical advice on how to compete and succeed. RELATED: Where Is the Next Generation of IT and Data Geniuses? You can also see the show schedule here: http://www.hostingcon.com/account/events/schedule and a speaker list here: http://www.hostingcon.com/account/events/speakers. For the latest information on HostingCon 2011 or to register for this year’s event – be sure to visit: http://www.hostingcon.com. If you want to see a list of HostingCon 2011 exhibitors please see: http://www.hostingcon.com/account/exhibitors. Another great way to keep up on HostingCon news and events is to check out the HostingCon Twitter feed with the name @hostingcon at: http://twitter.com/#!/hostingcon. Why is HostingCon taking place in SF/Bay Area? Wouldn’t it make a lot more sense logistically, or is it an excuse for everyone to get a chance to hit the beaches in San Diego. Will there be anything discussed besides cloud hosting? I would be interested to read a wrap up because I cannot go. Will any bloggers or tweeters be doing live coverage?